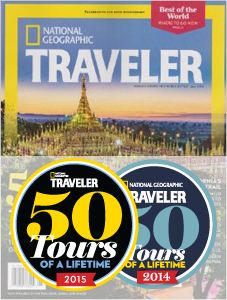 We are excited to have a guest blog post from one of our travelers, Steve Wilson. Steve is taking an amazing trip and is chronicling his adventures on his blog, A Hungry Man Travels. Follow his travels by reading his blog and checking out his photos. Thanks, Steve, for sharing your Indonesia experience with us! Julia Roberts and I haven’t had the priviledge to meet, but we've been close to each other – inadvertently AND innocently I might add. 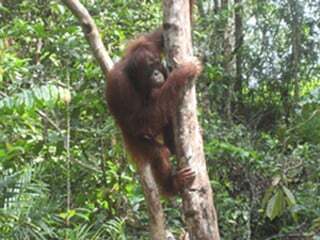 If I had the chance to meet Ms. Roberts, the first thing I would say is “Hi Julia, did you know that you and I shared a room at the Rimba Orangutan Eco lodge in Borneo?" If that fails to get a reaction (and lets’ face it, it wouldn’t), I would then quickly ask her: "what were you thinking getting so close to that Orangutan in your documentary?" Ok, I wouldn't quite say it like that but I sure would have to wonder what would possess one of the biggest stars on the planet to do something even us nobodies were told over and over by the guides, signs, and locals not to do if you ever meet an orangutan, especially the King of Orangutans, face to face. Ah Julia, the crazy world you live in. I know in your documentary you weren’t giving us your world famous laugh when Kusasi, then the King of Orangutans, grabbed you and held on while the guides had to pry him off you and I don’t blame you – it probably wasn’t a good time for you I’m sure. So I thought of her as I sat and stared, from a very far distance, at Tom, the current king of the Orangutans, thinking “Man that animal is HUGE”. Maybe it’s me, but looking at him I’m just not getting that ‘I want to be your friend’ vibe Julia claims these animals seem to send out to us. Regardless of that, I was also thinking “wow I can’t believe I’m here” - staring in awe at the Orangutans, watching us, watching them, in the beautiful jungle setting of Tadjung Putting National Park. 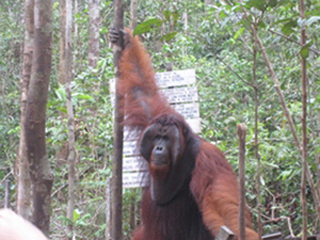 This setting was made possible thanks to the tremendous efforts of Canadian Dr. Birute Galdakis. Without her powers of persuasion this park wouldn’t exist and neither would the Orangutans. It is not an easy trip to get to the park from many Indonesia tours. Your options include taking a ferry boat (24 hours) or fly three different flights, (starting from Denpasar Bali it’s about a 24 hour trip) but it is so worth the journey. The adventure starts the minute the plane lands at Bandera Pangkalan Bun airport. After a short drive you then jump into a Kelotok (Indonesian boat), leave the Port of Kumai on the Java Sea, head up the Sekayer River and about two hours later you’re transported into the world of Orangutans at Camp Leakey. At the camp base they have a small museum dedicated to how the sanctuary came to be along with the family trees of all the Orangutans living in the park. 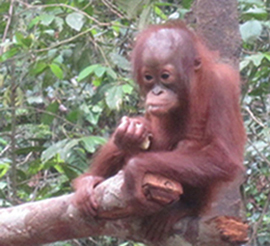 There is also a very compelling argument advocating people not to use palm oil, as it is responsible for the destruction of a huge percentage of the rainforests in Borneo. Compelling, but difficult to accomplish once you realize that palm oil is in just about everything you can think of! 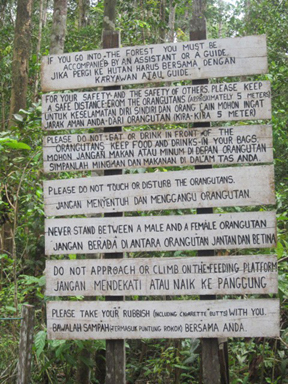 From the minute you arrive at the camp there are signs everywhere warning tourists to not touch, feed, go near, or stand between a male and female orangutan. Inside the museum they have a picture of the arm length of a typical male orangutan. Let’s just say that if Tom wanted to reach out and grab you, he could. Easily. Yikes, I realize this is beginning to sound like a ‘don’t touch the animals’ sermon and that really wasn’t the point of writing this; to put the fear of Orangutans into you. It is, however, an opportunity to recognize that these animals are special and not here for our entertainment. They are endangered beings lucky to be living in a truly amazing place thanks to the work of Dr. Galdakis and the people who work with her. It was a priviledge and pleasure to get the chance to see them up close and personal in their world rather than a zoo. You appreciate even more the incredible magnificence of these animals. It was a real eye-opener watching them swing from tree to tree; mothers with their babies clinging to them as they grabbed their food. And then there was Tom. When he came into the camp clearing, albeit he snuck up behind us,I have never seen people (myself included) scatter so fast in my life. My guide had warned me before that he may show up and if he did I was to give him a VERY wide berth. He isn’t king for nothing! So if you do decide to take the Indonesian Orangutan Excursion to Tadjung Putting National Park, be prepared for a trip that will change your whole attitude, perspective and knowledge about jungles, Orangutans and other animals, vegetation and people who depend on it for survival. Oh and be sure to thank Julia privately for opening all of our eyes to the joy and dangers of dealing with orangutans and how it’s important to appreciate their beauty - from afar! It’s not all about the Orangutans though. Afterwards you relax on the kelotek with the crew; enjoy a traditional Indonesian meal; lounge on the deck while staring at myriads of birds and other animals; crane your neck for the slightest sign of a crocodile; look up at the trees that are filled with Proboscis Monkeys and Macaques; wonder if some of the local vegetation would even last a day in the cold of Canada – it really doesn’t get any better than that let me tell you.